When thinking for somewhere to take a young child in a pushchair then going to visit a castle would perhaps come pretty low on the list. Having taken my daughter in a pushchair to a few castles whilst I agree that there are some you would not really want to visit there are also some castles where it can be an enjoyable experience. 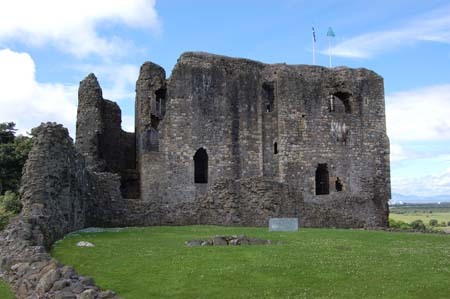 Dundonald Castle, in Ayrshire Scotland is one worth visiting. We visited the castle during our holiday at Craig Tara, Haven Caravan site, in Ayr Scotland. My wife did not feel up to the visit so it was just my daughter and I that went along. After parking in the free car park we went to the visitors centre and purchased a ticket to the castle. From then it was a climb up the hill to the castle. Fortunately the path up to the castle was in very good condition so there was no problem getting to the top (other than being a bit out of breath). As you enter the castle there is often a guide to show you around. She was showing some others around when we arrived, but she did say she wouldn’t be long so we started to explore the castle on our own. We left the pushchair in the bottom of the castle and I carried my daughter up the spiral staircase to the first floor. Although going over the original staircase the spiral staircase was not too difficult to negotiate. We then continued up a modern staircase up to the top of the castle and a magnificent view of the surrounding area. After visiting the top of the castle we joined the guide inside the main hall area where she gave a short talk about the castle. We then went back into the pushchair for a walk around the castle. Although this did involve some walking and carrying my daughter up the stairs, as they were in such condition this was not a problem, and there were no problems with leaving the pushchair downstairs. The one area we didn’t visit was the dungeons, but that was more due to my daughter not been so keen on being inside the castle let alone down the dark dungeons. I’m sure some children would love that, but it wasn’t for us that day. We then went down to the bottom of the hill back to the area with the visitors centre and a local park. The visitors centre included toilets (with plenty of space to take the pushchair in). They did not have any baby changing in the actual toilets, but at request (or in this case they asked me) they let us into the store room where they had a baby changing unit. After a play on the swings and slides, and an ice cream from the visitors centre (which includes a basic cafe) we left. A fairly short visit, but it had enough for what we were interested in and we had an enjoyable day. This entry was posted on Thursday, August 30th, 2007 and is filed under Babies, Children, Holiday, Tourism. You can follow any responses to this entry through the RSS 2.0 feed. Both comments and pings are currently closed.